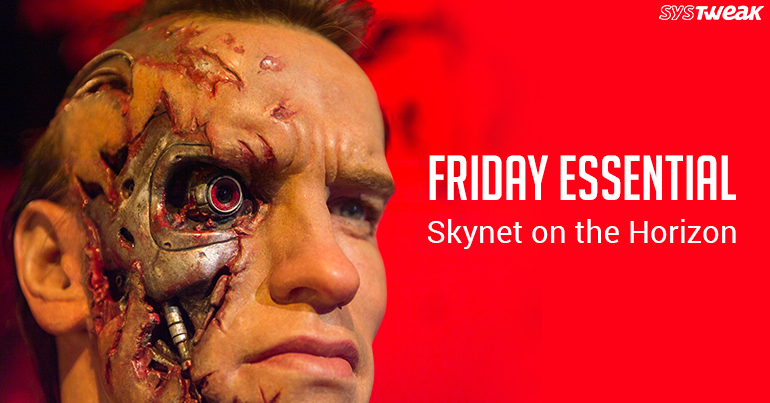 Friday Essential: AI to rule the world? No one can deny, the combined genius powerhouses like Elon Musk and Bill Gates. So, if they say something like ‘AI can potentially end mankind’, one sits up and takes notice! Why do they fear AI? Too many binges, watching The Terminator, RoboCop? Are they regular viewers of the WestWorld or the Black Mirror? Are tales of futures dominated by machines true? Are we living under the illusion of a humanised but still distinctly unhuman reality? The biggest question in all of this, are their fears justified? Do we need to worry about SKYNET becoming a reality in the near future? One of the biggest worries that plagues any tech savvy user of online applications and portals, is the distribution of his personal data onto multiple platforms. This data leak is happening either knowingly or unknowingly. A massive scale of operation is being undertaken to Data Mine. This is being undertaken rather easily by giant tech companies, either in the pretense of filling up consumer information, or asking random questions of a destination that has been visited by us (thanks to the GPS) or even predicting our food preferences due to the multiple food delivery apps. It makes one feel like big brother is watching over our every move. Some countries have strict data sharing policies due to which governments keep a control over the citizens. While this may seem like an atrocious idea to many of us in the free world, it is infact, a reality for all of China. Apps like Skype, Facebook, Tinder, Twitter are officially banned in China, but, newer companies have make similar functionality applications and as users use it, their data and preferences is stored with them and then shared with the government. Can you imagine, with 900 Million citizens of China using one application( that covers chatting, image sharing, dating profile browsing, money transfer, location and food delivery options amongst the other features) the size of data that is being gathered is astounding! Artificial consciousness is explained as, “Define that which would have to be synthesized were consciousness to be found in an engineered artifact” – Aleksander Igor. Robots like Sophia, ( a robot that was presented again in the recently concluded Consumer Electronics Show ‘18) Siri, Alexa, Go Google surround us. They are a part of our everyday lives. The amount of personal information that they are storing in regards to us ( they may deny, but we know better!) is again beyond imagination. This said data is helping Robots/Machines think like us, but is also working as a stepping stone for their ‘self-learning techniques’ with which, machines will be able to carry out tasks in such manner that we would consider ‘smart’. Keep in mind, that in an interview in 2016, when asked whether Sophia would ever harm humans, she famously responded “Ok, I will destroy humans!”, a sentiment that she has since retracted on numerous occasions. To think, this is the same robot, who is currently being hailed by many as the next step in Artificial consciousness! Emotions, human nature, reactions in situation etc can be fed to a robot being, through all the data that is being gathered over time. But, the minute it comes to Logic and for that matter in the hypothetical situation, if a robot could statistically analyze that human error threatens an important mission, it’s next logical step would be to eliminate the threat. Multiply that to a global scale, and you suddenly have SkyNet.